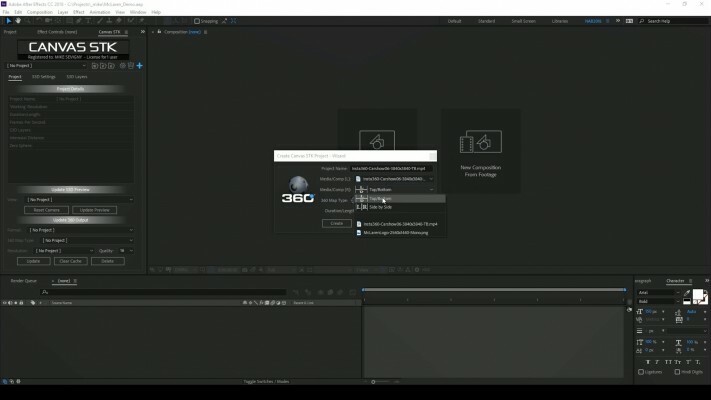 Setup your After Effect inteface. When you start a new project you’ll have to reorganize your workspace depending on your system and the number of monitors. We reccomend to use a secondary monitor, if possible and for the best results is to use a 3D monitor or 3DTV. At Torus Media Labs we use various different 3D viewing devices: a 3D projector, 3D professional monitor, passive 3dtvs and all the way to cheap 3dmonitor (active). We suggest a passive system. 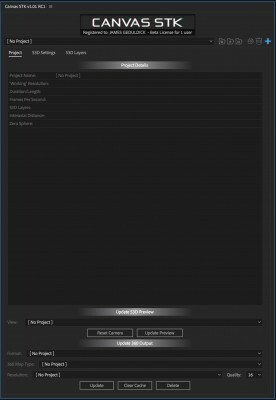 Link your headset only to the output composition window which can be generated from the bottom of the ‘Project’ tab by clicking the ‘Update’ button. Please remember that you will not be able to check your stereoscopic accuracy through the headset, use it just to check the effectiveness of your work in 360. Using the distance from camera value you can move it in front or behind that Zero Sphere. Don’t forget to check around your footage as you want to find the furthest point of the Zero Sphere. As we explained above the Zero Sphere is not a perfect sphere. 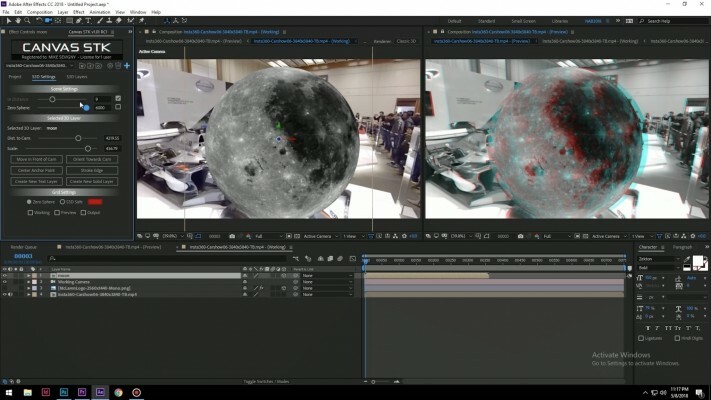 Finding the Zero Sphere when you start your project allows you to safely create layers and you’ll never hit that uncomfortable misplacement in space. After that you can simply use the grid as a reference. 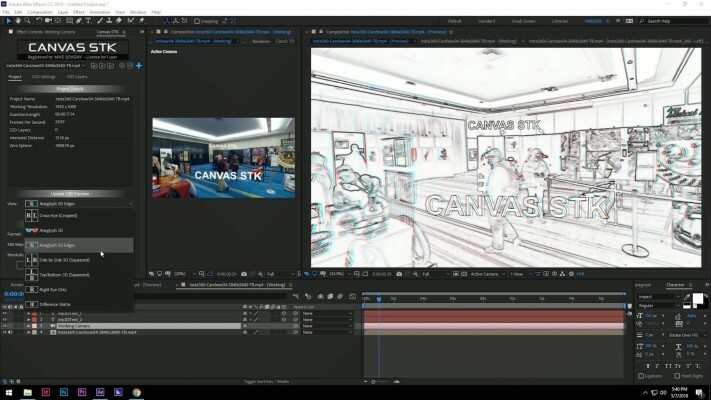 S3D layers are stereoscopic layers that can be created from the Canvas STK interface. These layers are formed by omni-directional stereoscopic images to be composited with your S3D360 footage. It could be a logo, a green screen subject or a rendered 3D model, as long as it has a Left and Right eye. Monoscopic media can also be imported by simply selecting the Left eye again in the Right Eye dropdown. Only the layer that you have selected inside the “Manage S3D layers” listbox. The layer will automatically be deleted from your working composition as well. 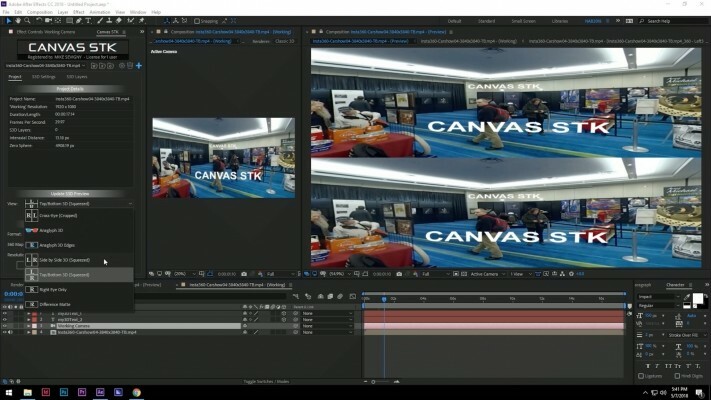 In the event that the Left and Right eye source media was mislabeled, you can click this button to flip them and correct the problem without having to recreate the S3D Layer. 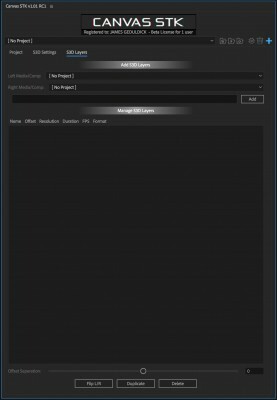 The most effective and accurate way of properly placing your S3D layer in space is to use the S3D Settings tab “Distance to Camera” and “Scale” values. Remember to select the layer you want move in space in your ‘Working’ composition timeline. Using a 3D monitor or a 3DTV for this fundamental task will give you the most accurate results. Final output. We suggested all along to work without your headset but now it’s the moment. It’s time to check your work on a viewing device similar to the one your audience will experience your VR film. For viewing on your headset you’ll choose Top/Bottom in the output format dropdown menu. 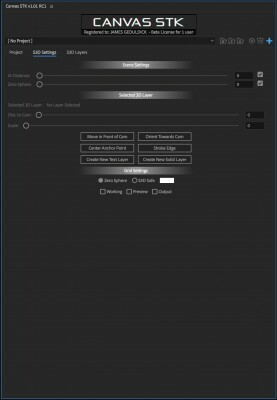 We also allow you to export in various formats (not all of them will be compatible with your headset). 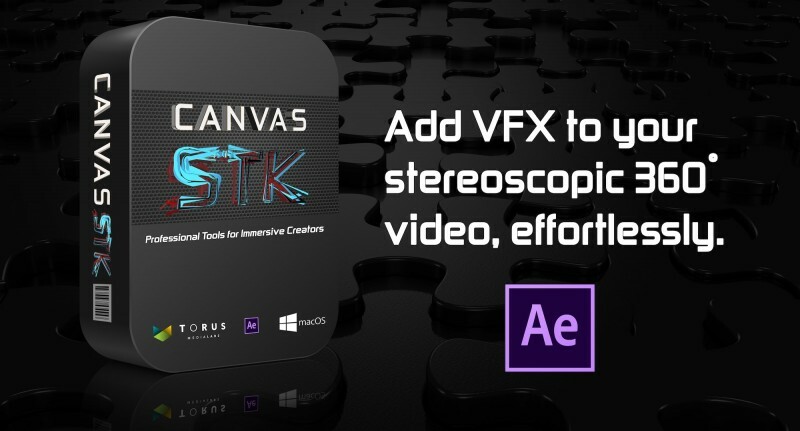 Canvas STK was developed using the two most popular VR headsets. Create your output and view it with your headset. If you notice some vertical splits in your composited images, this could happen when your s3d layers are too close to the camera, you can turn the quality setting to higher values. The value of 8 should work just fine for most situations. 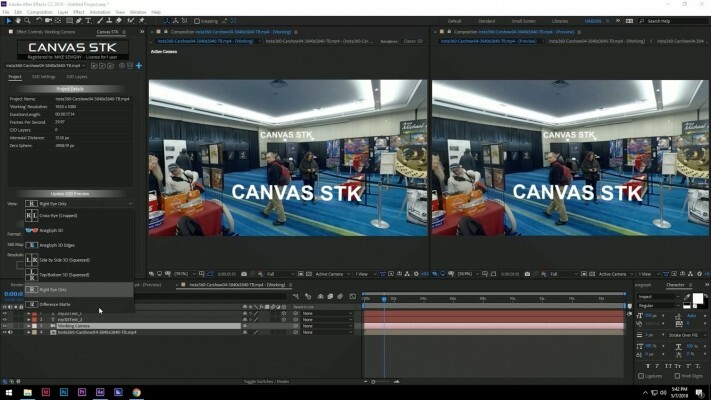 Please be aware that this setting will not fix any issues from your background stereoscopic 360 footage, it applies only to the layers you’ve added to the project. 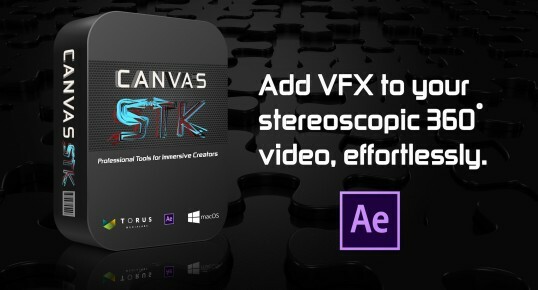 For more informations about Canvas STK , follow our newsletter and postings on facebook. 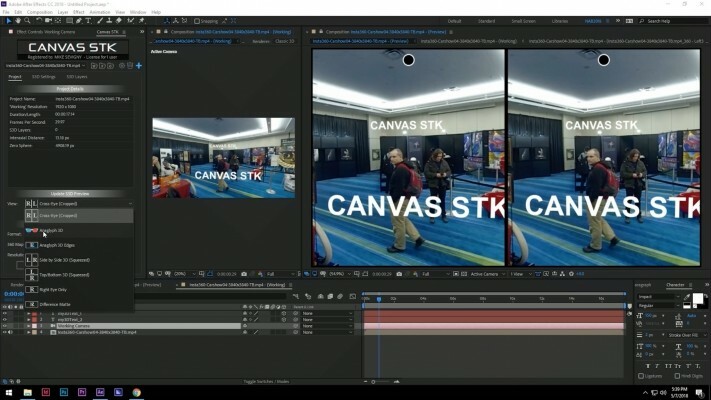 Canvas STK was developped to provide you the same compositing accuracy available for S3D movies . 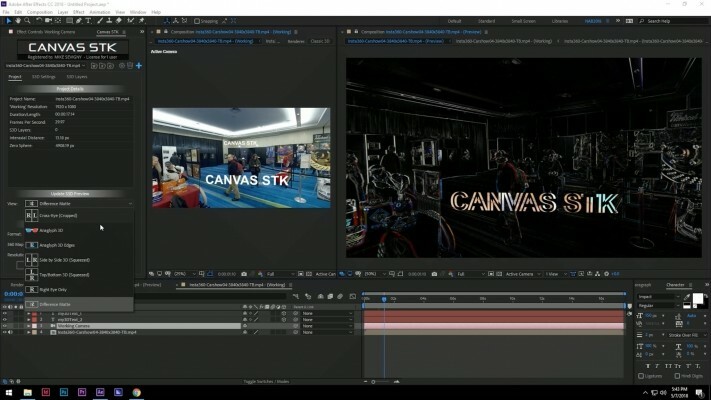 For that reason it allows you to use that same professional equipment in post-production to reach that level of detail that is specific to cinema. Many post-production houses have several 3D monitors in their suites, probably most of them are used rarely for their 3D functionality. 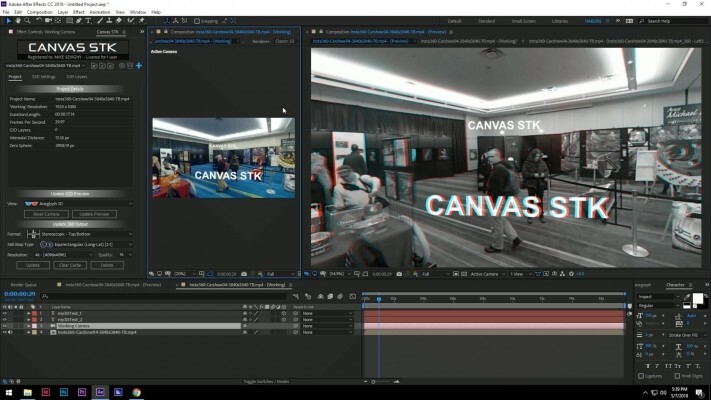 With Canvas STK you’ll be able to use them again for what they are intended for and with S3D360 video you’ll have a chance to use them more than you ever did. 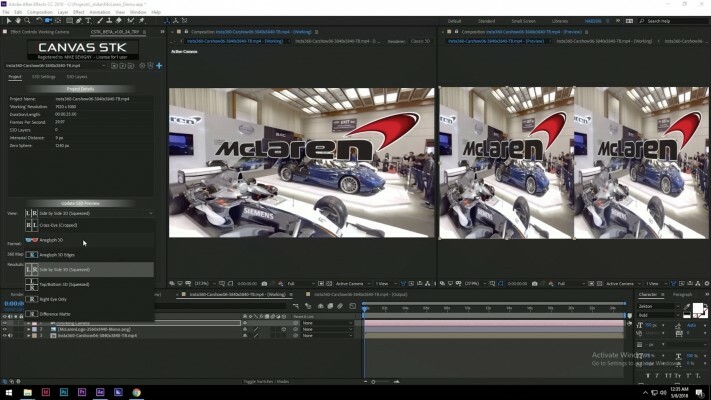 The VR medium is stereoscopic by nature, the coming 6DOF is stereoscopic the same way as it lives inside the same VR medium. Humans have two eyes and until our eyes will be replaced by bionic super-eyes we’ll always percieve depth through our stereoscopic vision. The language and subtleties of stereoscopic imaging are still being explored by University researchers and artists all over the world. We can enjoy this great wealth of knowledge and research available to increase our own knowledge and apply it in an artistic and meaningfull way. Please remember to preserve the audience’s eyes as much as yours . To achieve good 3D you’ll have to view bad 3D and make it better. 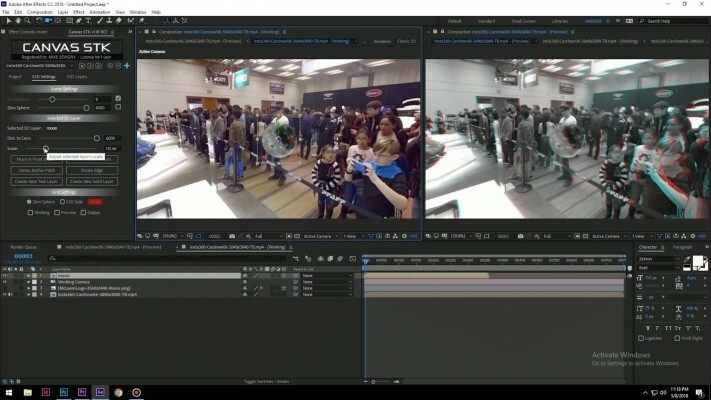 To allow you to work for extended periods of time you will want to preview your s3d360 footage, we highly suggest you use a 3d monitor or 3d tv, passive if possible.